I do not want to start too many hares running, but I suggest that if a newcomer to opera listened to La Traviata and then Il Trovatore, one after another, he or she would quickly identify the composer as one, no matter the different moods and key register. If the same listener did the same with Die Zauberflöte and La Clemenza di Tito I doubt that the listener would identify the works as being by the same composer. What each pair has in common is contemporaneous composition. Of course the Mozart works are of completely different genres. Die Zauberflöte is a singspiel with spoken dialogue composed for performance in a lower class district of Vienna. Tito on the other hand belongs in the rather static opera seria genre with secco recitatives. It was composed for the Coronation Day of Emperor Leopold in Prague. 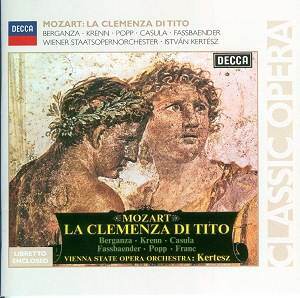 Mozart had seemingly put the rather static opera seria form aside after the composition of Idomeneo in 1781. The reason that Mozart reverted to opera seria for this prestigious commission is explained by the background politics of the Vienna Court. He was certainly not flavour of the month in Court circles, not least with Emperor Leopold and his wife. Mozart must have been mightily surprised to be approached by the impresario Guardasoni and to receive the commission. There had been much prevarication as to whether there would be a Coronation Opera and the impresario only signed the contract on 8 July 1791. The agreement specified a new opera but recognising the shortage of time it allowed for a newly-composed work based on Metastasio�s libretto of nearly sixty years earlier. Any modification was to be carried out by Mazzola, the Court poet who had replaced Da Ponte. Guardasoni approached Antonio Salieri to write the work. Salieri was Principal Kapellmeister at the Imperial Court in Vienna. However, Salieri had to cover the work of his favourite pupil, Joseph Weigl, at the Court Theatre as well as his own duties and he refused, pleading pressure of work. Mozart accepted the commission in late July or early August and worked with Mazzola whose efforts the composer described as having converted Tito into �a real opera� (Mozart�s Last Year, H.C. Robbins Landon, Thames and Hudson, 1988). Having some of the completed libretto, but knowing little of the singers, Mozart set out on the four-day coach journey to Prague on 25 August. He was accompanied by his wife and by pupil Süssmayr and when they started out it was a mere twelve days before the scheduled premiere. It has been suggested that Mozart composed the opera in his head during that journey and transcribed it for the copyists on his arrival. Although he had that skill, the real story is more complex. Analysis of the paper types used in the manuscript and other sketches indicates that some numbers were composed before Mozart knew of the commission. These could go back to 1789 when Mozart met Guardasoni in Prague after the success of Don Giovanni and hoped for a further commission to write an opera on the subject of Tito. In the days between arrival in Prague and the Coronation Day, Mozart worked feverishly, and through illness, to complete the opera. It is suggested that he delegated the composition of the secco recitatives to Süssmayr. The overture was only finished the night before the first performance. The opera was presented in the National Theatre on the evening of the Coronation Day with entry being free. The Empress was not impressed and the work played to a poorly attended theatre for the rest of its run, except for the last night when it was rapturously received. For the following forty years Tito was ranked alongside Don Giovanni as one of Mozart�s finest works, after which it was neglected. This 1967 recording was specifically aimed at filling a gap in the recorded catalogue and provided a first opportunity for many to hear the work. In his autobiographical series of articles, collated by his daughters after his death, Erik Smith, the producer of this recording, describes the difficulties of casting the opera. These were compounded by the work being too rarely performed to have given any choice of singers experienced in the roles (Mostly Mozart, Articles, memoirs, rarities and surprises, Erik Smith, Porcellini Publications, 2005). Tito had been staged at La Scala in 1966 for Giulietta Simionato�s farewell to the operatic stage. Around the same time there were performances in Cologne under Istvan Kertész, the conductor here. These featured Lucia Popp as Servillia. Despite that experience Kertész is an unsympathetic conductor. Much of the playing lacks what we now expect of Mozart operatic performances. His conducting is flaccid and lumpy and lacks drive and vitality. The eschewing of ornamentation does not help, with the endings of the arias seemingly cut off prematurely. The solo singing is distinctly variable. Teresa Berganza sings beautifully as Sesto without being dramatically convincing. Her Parto, parto (CD 1 tr. 15) sounds more like a concert-piece than a central pillar of the plot. Her voice is however sufficiently differentiated from the other �trousers� role of Annio which here is sung with good legato by the young Brigitte Fassbaender. She duets nicely with the Servillia of Lucia Popp in their tuneful duet in act 1 (CD 1 tr. 3). On the whole I was disappointed with Popp�s singing, which often sounds thin and fluttery. The wicked Vitellia is sung by Maria Casula, unknown before this recording and rarely heard on record after. The role is distinctly challenging. It is rather like a Mozartian Lady Macbeth but with the need to show some feminine vulnerability. This is particularly so in Vitellia�s great act 2 aria, with basset-horn obbligato, Non piu fiori (CD 2 tr. 17). Here Vitellia reveals the truth of the plot against Tito and Sesto�s innocence. Maria Casula is well worth hearing (CD 2 tr. 17). This was one of the pieces we know that Mozart composed well before he knew anything of the Coronation Day commission. It had been sung by one of his tenor friends and the pitch is lower than the rest of Vitellia�s music whose range extends from G below middle C to top D. The Sardinian Maria Casula was a mezzo who had shown her range in singing Rossini�s Rosina and Cenerentola. She really puts her all into the part and is thoroughly convincing if not matching some more famous recorded successors. On the male side Werner Krenn as Tito is a little husky and has none of the Mozartian elegance of Burrows. Tugomir Franc who sang in Decca�s recording of Mozart�s Requiem and as the Friar in Solti�s Don Carlo is ill-suited to the demands of Publio. This Decca recording certainly kick-started interest in Tito and acted as a catalyst for stage productions and other recordings. When Erik Smith left Decca to be head of A and R at Philips he scheduled a recording under Colin Davis. Davis had conducted it to acclaim in Anthony Besch�s 1974 Covent Garden production with its elegant period Roman sets and costumes. I caught the production in 1983 where the singing was outstanding and Diana Montague�s shapely legs more than compensated for Stuart Burrows� rather matronly deportment in a toga. The recording features Janet Baker as Vitellia, Stuart Burrows as Titus as well as Lucia Popp and Frederica von Stade. It far surpasses the achievement on the Decca reviewed here. DG added a version conducted by Karl Böhm with Julia Varady and Peter Schreier. Since then recordings have burgeoned with performances under Muti (EMI), Gardiner (DG), Harnoncourt (Teldec) and Hogwood (Oiseau Lyre). The period instrument bands certainly give vitality to the work. Most of these recordings include the Süssmayr recitatives - abbreviated on this recording. Performances on DVD include the 1991 Glyndebourne production (Arthaus). There�s also Ursel and Karl-Ernst Hermann�s idiosyncratic production that started life at the Monnaie in Brussels in the early 1980s and is caught, newly refurbished, at Paris�s Palais Garnier in 2005 (Opus Arte). Its great strength is the interpretation and singing of the delectable Susan Graham, the non pareil Sesto de nos jours. Whatever your views on the production her performance is not to be missed. This recording is of interest for its seminal importance in the re-emergence of La Clemenza di Tito on stage and record. As such it is well worth the mid-price cost which includes a libretto and English translation.